Ian Watson takes us on this journey with a charming if slightly amateurish personal style (the first line of the book is ‘Hi, you probably don’t know me, but assuming you stick with this book then we’re going to be spending quite a bit of time together.’) – don’t be put off by the introduction, the style settles down. Bearing in mind my bias, I found it absolutely fascinating, from one of the best section’s on Babbage’s work I’ve ever read, through the development of the electronic computer, into PCs and the web. On the whole, the historical content was at just the right level – enough to keep you interested without getting overwhelmed. I was slightly surprised Ted Nelson, who devised the hypertext concept, wasn’t mentioned, but there is always going to be something. Of course, there are parts of the story where a lot more depth is truly fascinating – so I’d recommend, for example, the classic Insanely Great and Hard Drive on the origins of Apple and Microsoft respectively – but for an overview this was hard to beat. Interestingly it’s at it’s best in an application context. The only time the text got a little dull was when Watson talked pure computing, and in the probably unnecessary future gazing bit at the end. What was odd about the book is that I know that it was published by a large international publisher (Springer Verlag), but reading it sometimes felt more like the experience you typically have with a self-published book. The text is too tightly crammed on the page, making it slightly uncomfortable to read. And there are rather more typos and basic errors than I’d expect in a professionally published book. One example that jumped off the page – Mary Shelley’s surname is written as ‘Shelly’ at least three times. (Funnily enough, her surname was actually Godwin when she wrote Frankenstein, though she had married Shelley by the time it was published.) There are a couple of places where the text doesn’t knit well together, resulting in some repetition. And it’s also rather unfortunate that the author says ‘you may be reading [this book] on a Kindle or iPad’ when there isn’t a Kindle edition. 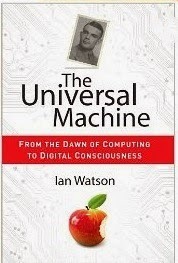 Overall, then, although I would recommend following it up with some more focused computing histories, The Universal Machine is a great way to get a real feel for where the machines that are at the centre of so many of our lives came from.